In the early season western anglers are more focused on familiar surroundings. Places that have paid off in the past, insect hatches that turn the trout and grayling on year after year, rivers and creeks that reassure and reinforce your sense of superiority over a critter that has a brain the size of a pea but often exhibits the intelligence of a PhD candidate and the cunning of a Ponzi artist. Or sometimes it seems when a big porpoising brown trout steadfastly ignores your March brown dry fly time and again while pigging out on any natural that has the unlucky fate of passing over his feeding lane. But after a while familiarity breeds contempt, even on the most prolific and willing trout streams. Sooner or later all of us get a little jaded and complacent about the same old same old. Summer is when it’s time to spread your wings and fly, check out some new water and fresh scenery, put a few klicks on your old fishing rig and explore the Four Corners of your known universe. 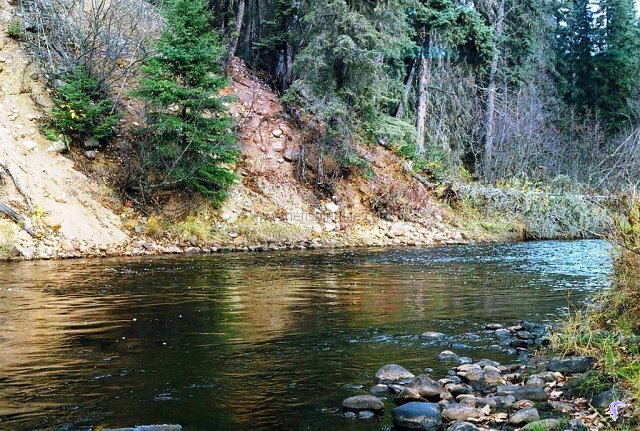 Here’s a north/south/east/west guide to some interesting new waters that aren’t on the radar of most Alberta fly anglers. 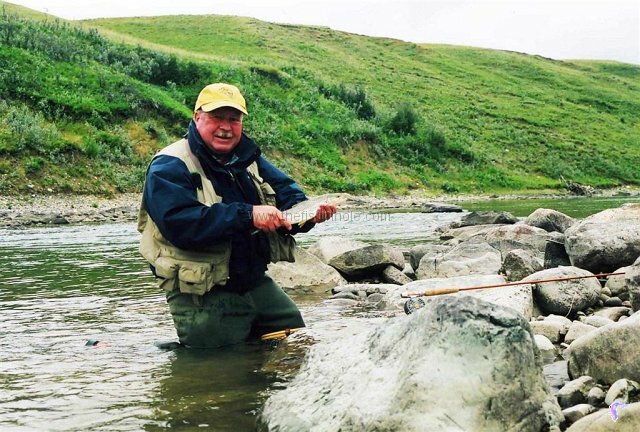 There’s no doubt the southwestern corner of the province in Alberta’s angling mecca. The Crowsnest River being the jewel in the crown with others like the Oldman, Castle plus the Elk across the divide in B.C. willing to give the Crow a run for its money. But the unheralded Waterton River, which drains the big, mountain-fed lakes in the national park of the same name and flows north through pristine high prairie range lands, is well worth wetting a line. Because while other southwest rivers hold rainbows and cutthroat, the Waterton’s primary quarry are brown trout. One overcast afternoon in August I explored a section of the Waterton east of Twin Butte. While the cool temperature kept the grasshoppers inactive in the long grass, the brownies knew what they looked like and were dispersed in the rock gardens at the top end of the pools. A well presented hopper imitation in the pockets and seams between the boulders was often rewarded by a vigorous strike and a spirited tussle. Even more important, while other southwest rivers can be victims of mid-summer madness, where every turnout and access point seems to be jammed with fishing trucks, the Waterton’s lack of profile means you can usually be assured of finding a day’s worth of fishing water all to yourself. It’s hard to conceive of trout fishing in the part of the province that the Palliser Expedition officially declared a worthless desert. But the southeast corner of the province does contain the highest point of land before you hit the Rockies - the cosmic and contrary Cypress Hills. Well, hills generate ground water and springs join together to become creeks. The most important being Battle – named for the infamous massacre of a camp of Assiniboine Indians on it’s banks which trigger the great march west of the North West Mounted Police to drive out the American whisky traders responsible. The Battle rises in the Alberta sector of the Cypress Hills and flows east and south, eventually ending up in the Missouri River. So to give yourself maximum flexibility it’s probably advisable to hold both an Alberta and Saskatchewan angling license. Plus if you want to fish inside the Fort Walsh national historic site, you are also required to pay a National Parks entrance fee. (Nope, your mountain national parks pass doesn’t work). It was a typical August Cypress Hills day with the temperature hovering in the low 30s when I paid my last visit to the Battle. There were no apparent bugs riding the creek’s mysterious discoloured riffles from a landslide further up the drainage. But the rainbows up to 14 inches didn’t seem to mind coming willingly to a Variant pattern I had concocted for the occasion. 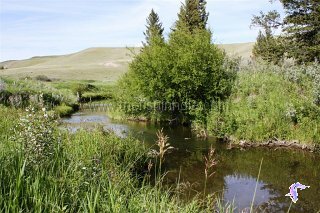 A good drift over the usual fishy places – undercuts, scours, corner pools, overhanging willows – more times than not raised a fish in a gorgeous landscape of lush coulee vegetation. The creek is accessible from a good weather trail through the park and at Fort Walsh. But keep your eye on the sky. The trail can quickly turn treacherous in a thunder storm. There are also several stillwater trout fisheries in the Cypress Hills – including Alberta’s hot Quality Trout Fishery, Bullshead Reservoir. Even though there’s paved highway access and fine services towns in Grande Cache and Grande Prairie, the creeks and rivers that feed the glaciated Big Smoky River are largely in the category of a stream too far. Which is too bad. Because the northwest has some fine Arctic grayling, rainbow trout and bull trout fishing that’s worth a blip on anyone’s angling radar. The finest being the Kakwa which comes charging out of the high ground before entering the Smoky north of Grande Cache. Access is available where river passes under the highway, but on a recent trip to the Kakwa I followed my instincts and some oil roads and found my way to the river several klicks above the confluence. The Kakwa, even in August, is a big river with a long hike between pools over a boulder-strewn flood plain. But big water usually means big fish. 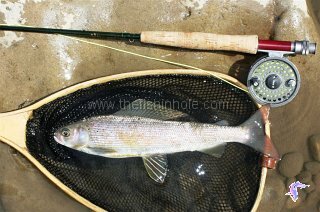 The Kakwa didn’t disappoint with gorgeous grayling up to 14 inches and beyond rising willingly to Adams Humpies and Golden Stone dry flies. The Kakwa is equally renowned for its bull trout population. Other northwest rivers well worth a visit are the Muskeg, Sheep, Berland and Wildhay. Flyrod angling in northeastern Alberta – unless you like pounding pike which not exactly unattractive – would appear to be an anomaly in an Eastern-Slopes-orientated province. Well it shouldn’t be. 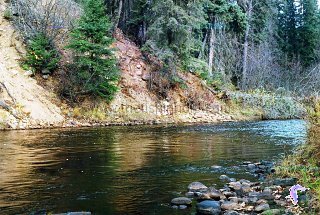 Because the big, bad boreal nurtures many rivers and creeks that twist and turn through jackpine-clad banks of glacial till that look every inch a trout stream. If you ignore the fact that they are stained the colour of strong tea and visibility under the best of conditions is confined to a few inches. These muskeg rivers hold grayling populations the hue of antique pewter that feed freely on dryflies. One of the best being the House, which for much of it’s existence flows in a westerly direction before turning north and ending it’s run in the Athabasca River upstream from Fort McMurray. On one particular mid-August afternoon the House was flowing sweet and black. The grayling were stacked at the pool heads and along the foam lines and ate any H and L Variant I presented over their feeding window. On other visits I rigged with a hopper/dropper set up with a Yellow Stimulator as the indicator fly and a Bead Head Hare’s Ear on a tippet dropper tied to the Stimmie’s hook bend. It seemed a million miles away from the crowed creeks of the Forestry Trunk Road on any sunny weekend in summer as I released grayling after grayling.